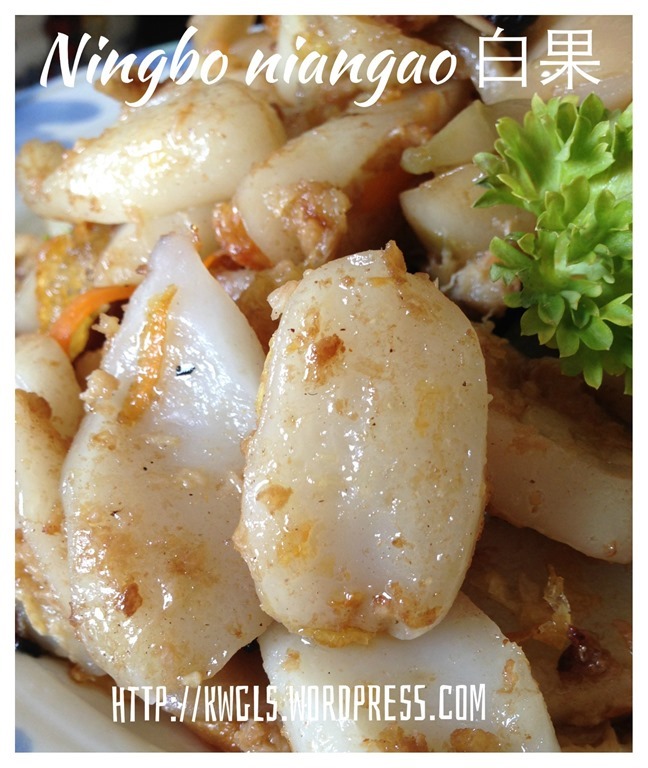 I swore I never like to cook this glutinous rice cake (Ningbo Niangao (宁波年糕） or Shanghai Niangao （上海年糕）or Bai Guo Gan （白果干） ) as it has to be soaked for many days before it turn soft. 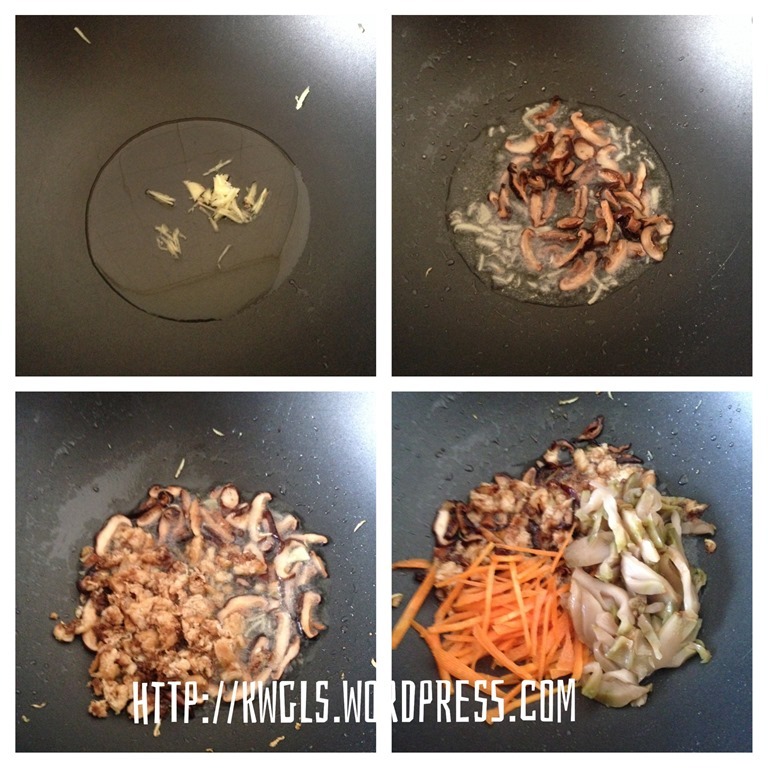 In addition, it is rather difficult to stir fry as it can turn mushy if too much water is added…. 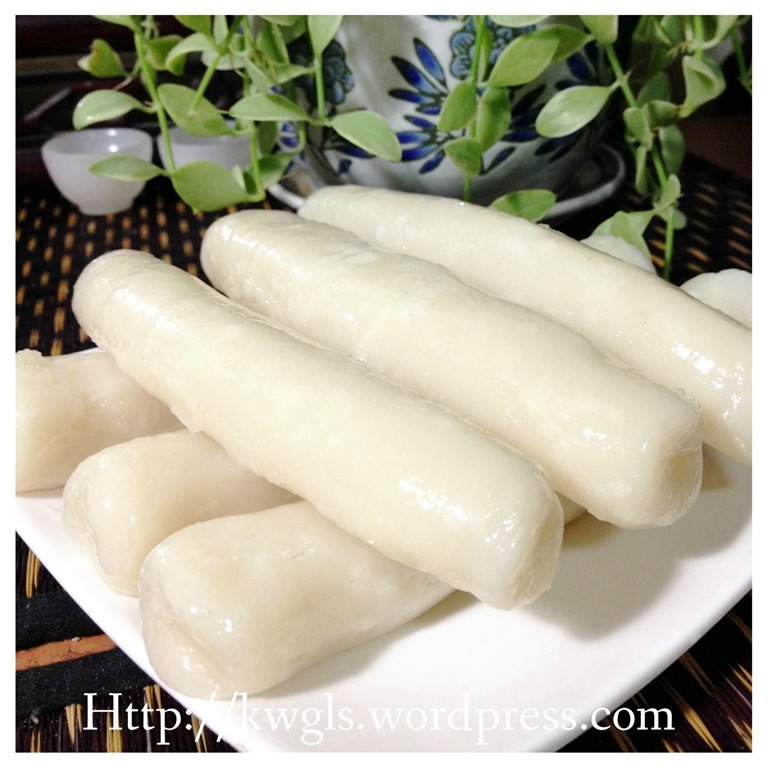 While I was glancing through the internet yesterday, I found a simple recipe of this glutinous rice cake.. Looking at the ingredients , it is just a 3 simple ingredients recipes and all are common household items. Out of my curiosity, I have decided to give it a try thinking without having any expectations on the rice cake. It didn’t take long for me to finish the preparation of this glutinous rice cake.. about an hour from preparation until finished steaming. I let it rest a night and early in the morning, I cut the rice cake and fry it in a vegetarian version.. When I took the first bite, I immediately knew that why this rice cake managed to capture the hearts of many Chinese. 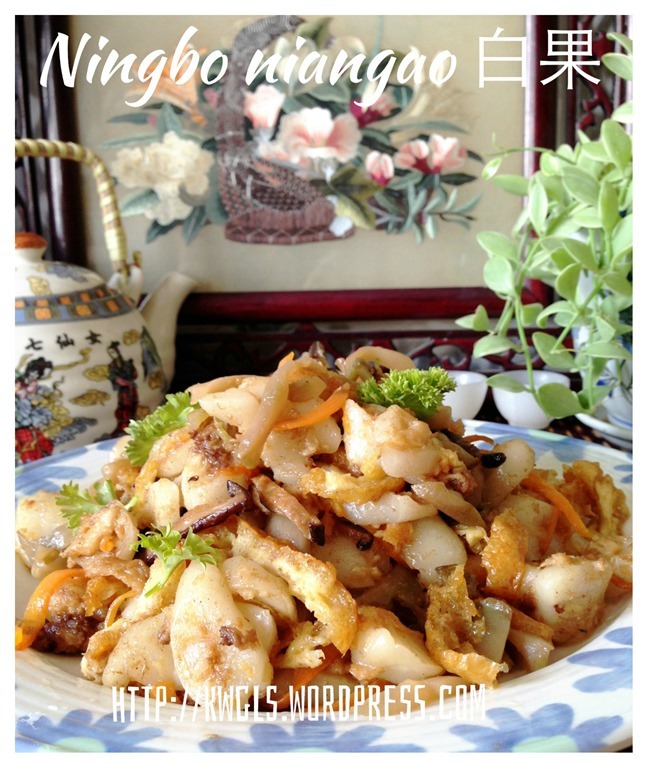 The texture is totally different as it is soft and chewy and it totally change my perception of this traditional rice cake. 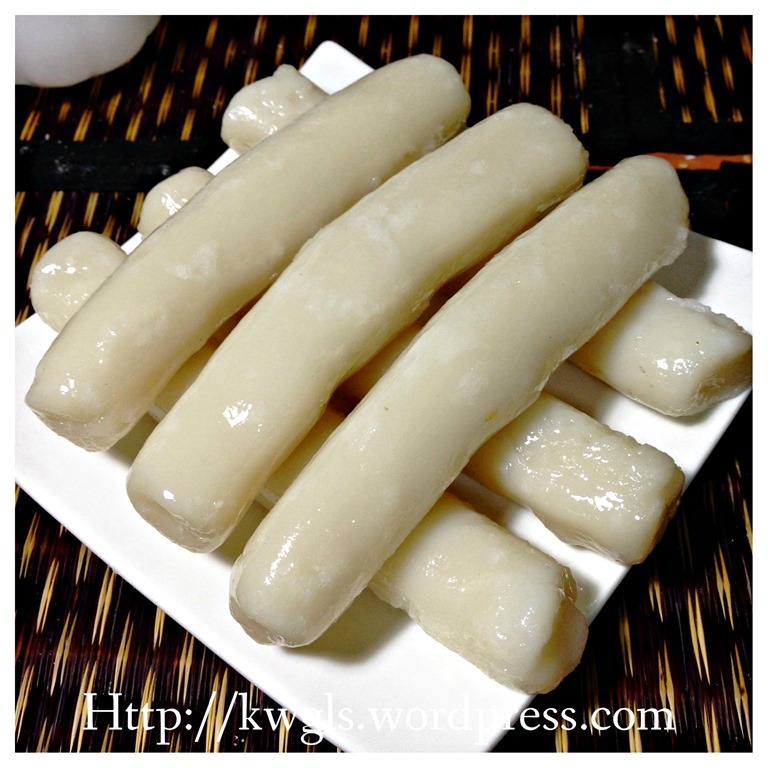 The main objective of this post is the sharing of the preparation of this rice cake. 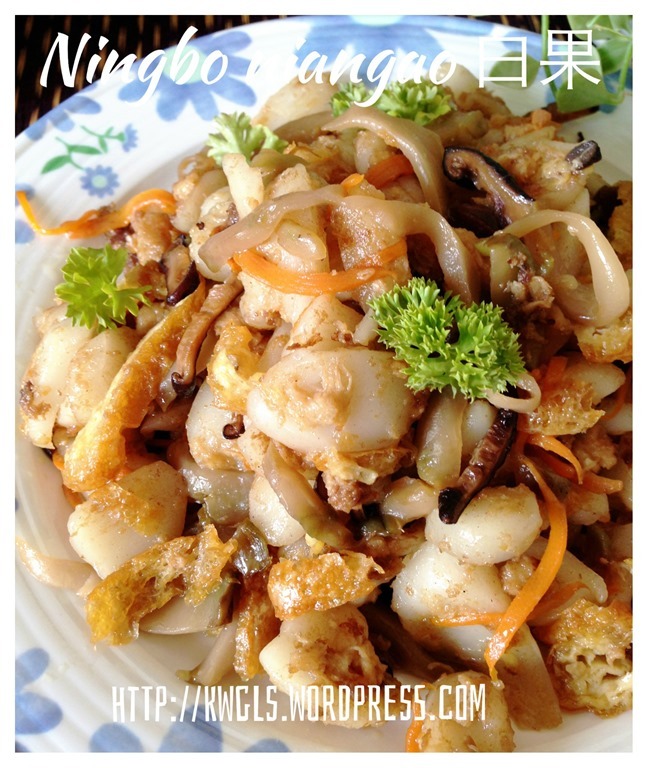 However, I will also share a recipe of how to stir fry the rice cake. As I am on a vegetarian diet, the illustration uses vegetarian ingredients but you can always add in meats, shallots and garlics when you are stir frying. Whether or not this rice cake is linked to Korean rice cakes or Japanese rice cakes, I am unsure but I believed they are closely linked as food history are all intertwined and not to mention that they are in the same geographical regions. 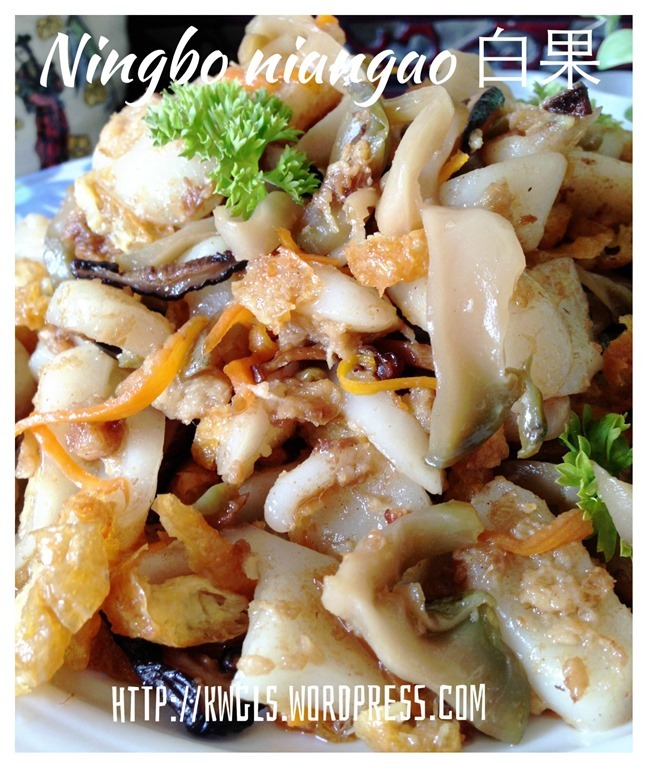 All quantities and ingredients are for your reference as this is a savoury dish. Get ready a steamer capable of steaming under high heat for at least 30 minutes and a small pot of hot boiling water. In a big mixing bowl, sift in the glutinous rice flour and rice flour. Add the water gradually and knead until it form a pliable dough. If too dry, add water tablespoon by tablespoon. 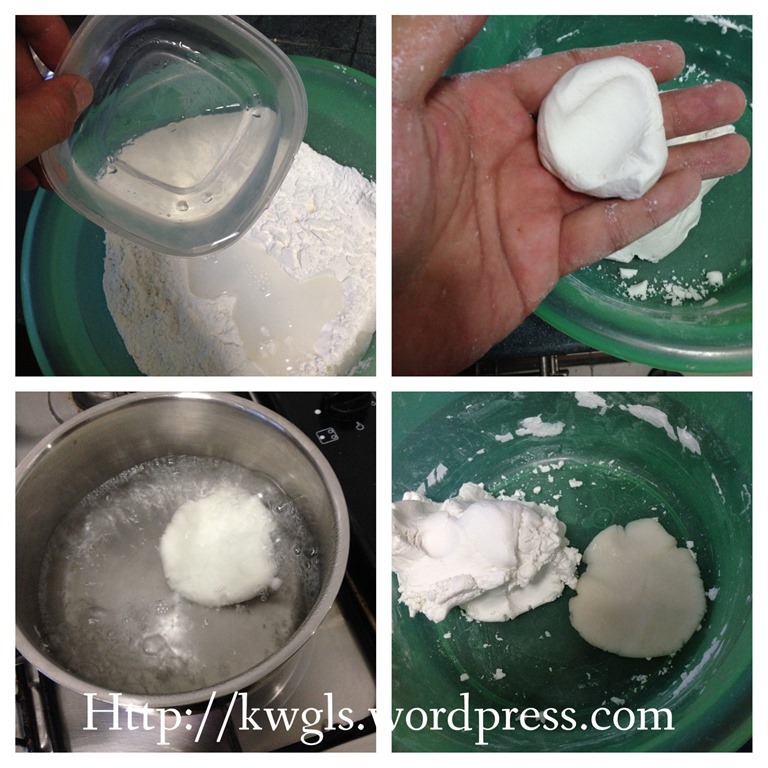 If too wet, add glutinous rice flour tablespoon by tablespoon. Take out about 40 grams of the dough, shape it round, pat in the hand and throw it to the pot of hot boiling water. Cook for 3-4 minutes or until the dough floats in the water. 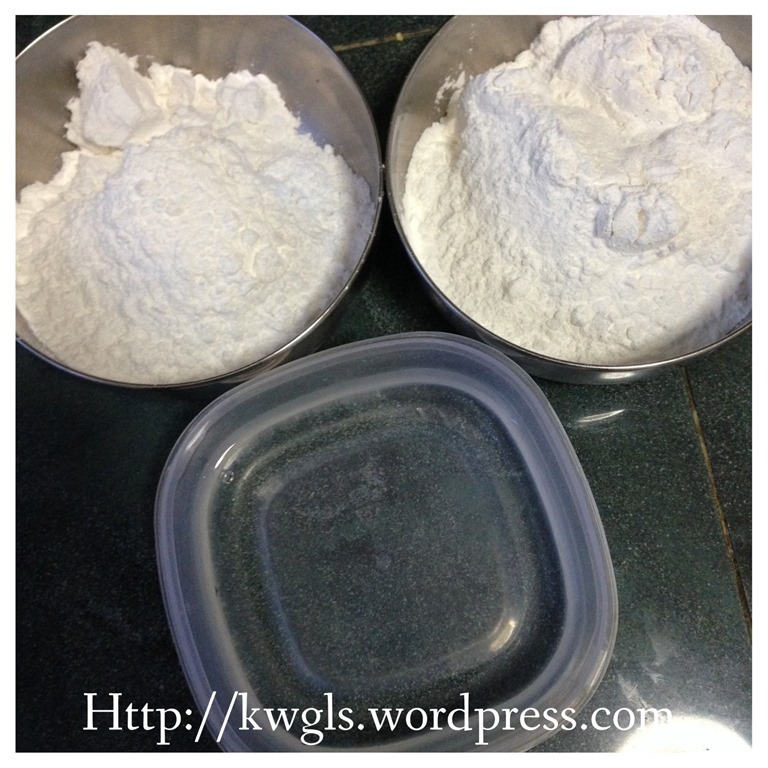 Transfer this small dough to the mixing bowl. 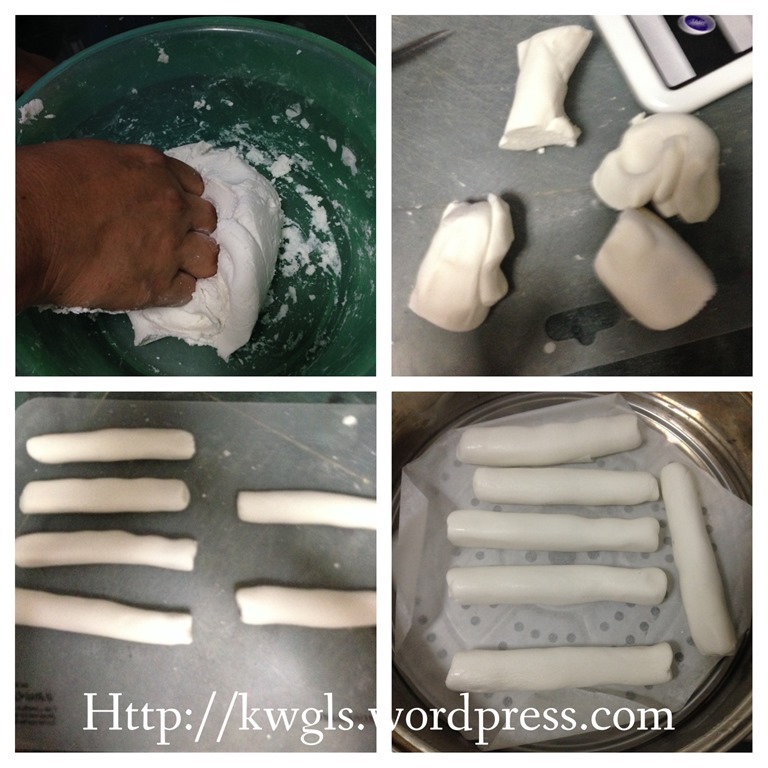 The purpose of this step is to ensure that the rice cake have a chewy texture. Use your hand to knead the cooked and uncooked dough together until well mixed. Divide equally into 6 portions. Shape cylindrical shape and steam in the steamer for about 25 minutes. Once done, to avoid sticking to each other, you can lightly grease the rice cake with cooking oil and let it cool completely before cutting into pieces for stir frying. For this illustration, I have let it rest overnight. The longer it rest at room temperature, the harder it will be as moisture are lost in the process. 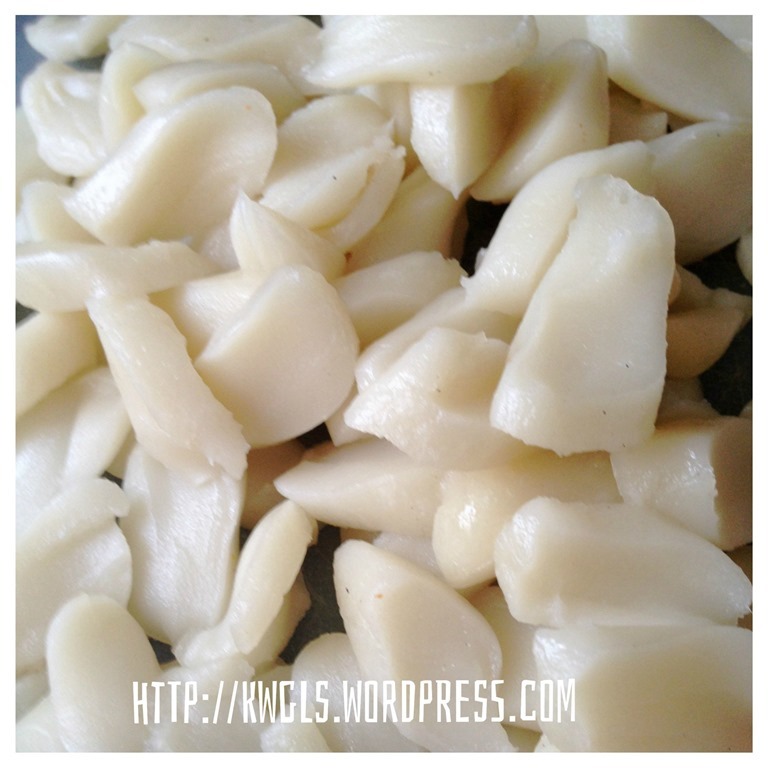 Slice the rice cake into small pieces. 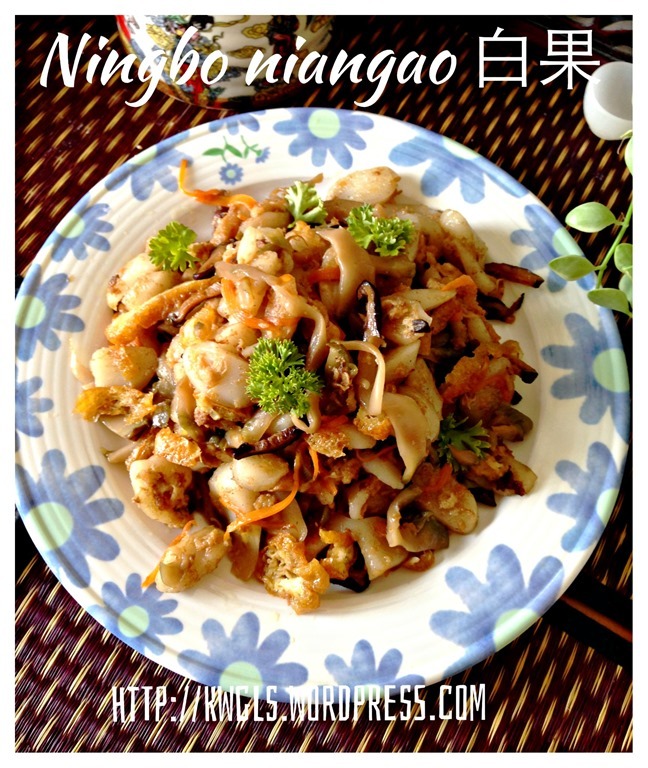 In a hot wok or frying pan, put some cooking oil, put the minced ginger or shallot or garlics and sliced winter mushroom. Sauté until fragrant. 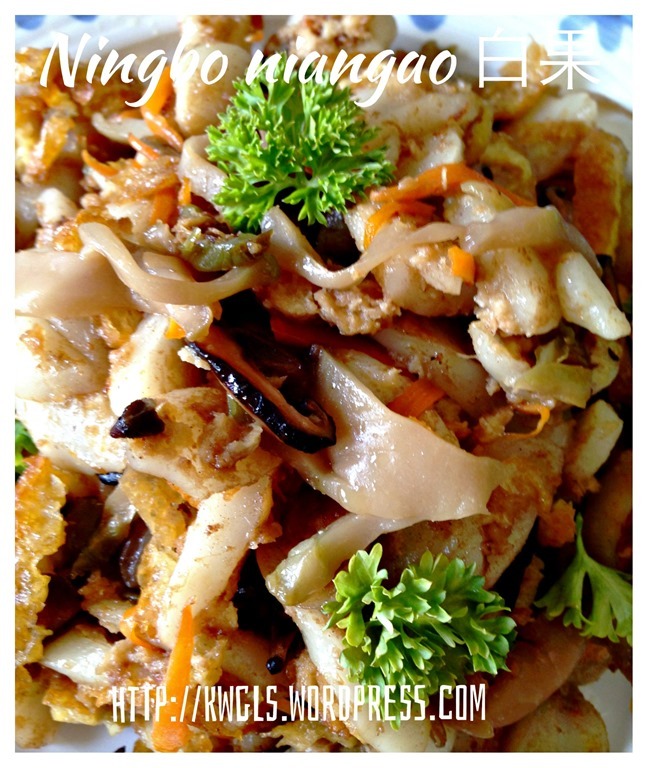 Add in the mock chicken or minced meat, stir fry for one two minutes followed by all other ingredients. Stir fry until well mixed. Add in the sliced rice cake, stir fry followed by adding white pepper and oyster sauce. Stir fry for another few minutes and dish up. 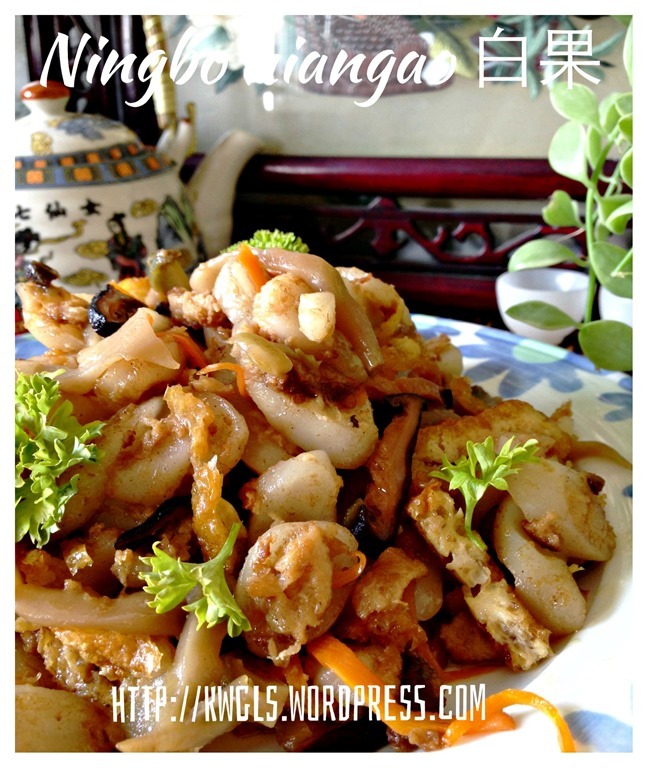 If in the process of stir frying, the dish is too dry, you can add a small quantity of water but not too much as it will make the rice cake mushy. Best served when warm. Again, I was shocked that home made rice cake’s texture is totally different from the store bought version. It is soft and chewy. It is easy to prepare with simple ingredients. 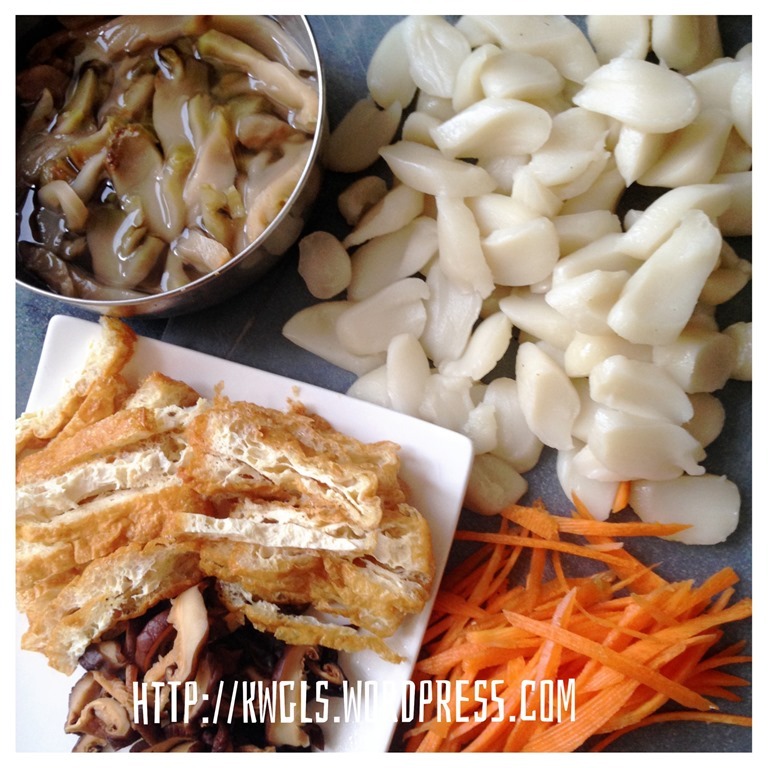 If you like Korean or Japanese rice cake, I am sure all of you will like this too. As this is a savoury dish, all measurement are for your reference. Feel free to change what suit your taste bud. 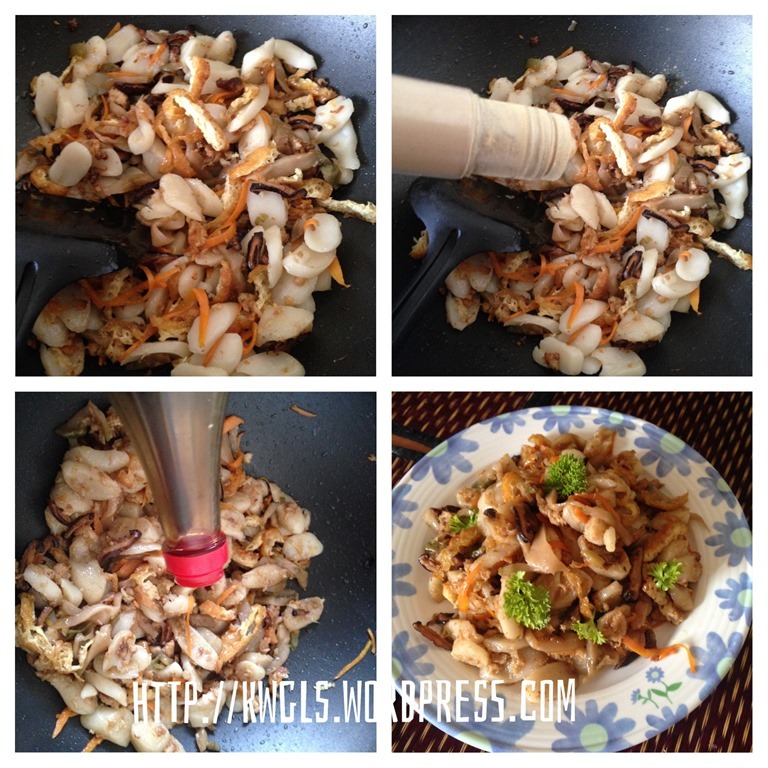 You can always use the same ingredients that you stir fry your noodles for the dish. 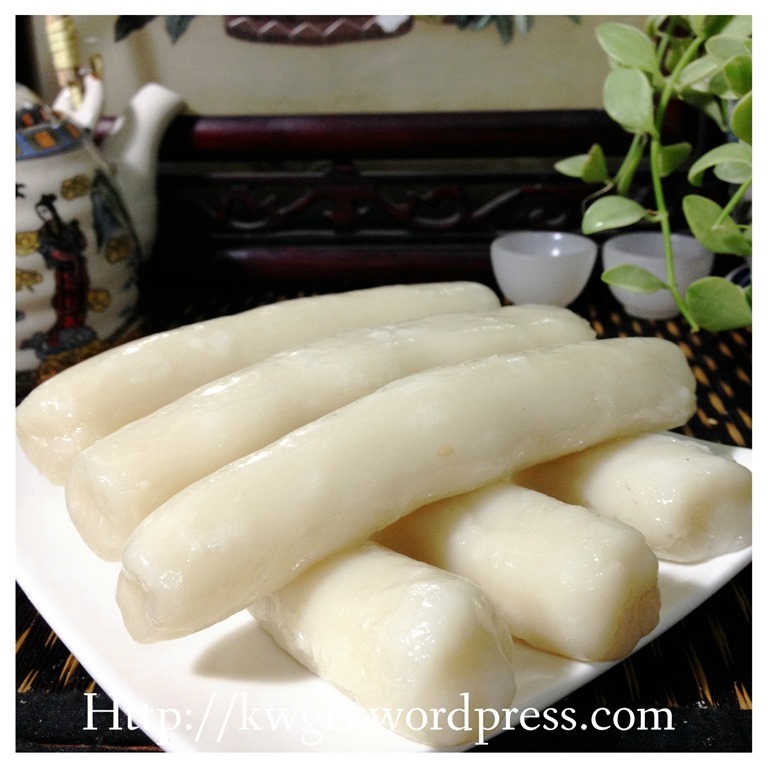 This entry was posted in Chinese and Asian Cakes and Snacks, Food Preparation Series, Noodles, Rice and Others, Vegetarian and tagged 8, Bai Guo Gan, 白果干, glutinous rice cake, GUAI SHU SHU, Guaishushu, kenneth goh, Ningbo Niangao, postaday, Shanghai Niangao, 宁波年糕, 上海年糕. Bookmark the permalink. You make me want to try every recipe you posted. Thanks. Do try. I am just simple old man with down to earth recipe.. Yes, you can. A few days but not too long. Looks so yummy! Definitely going to try it out very soon! Thanks for sharing. Thanks for sharing, Ken. 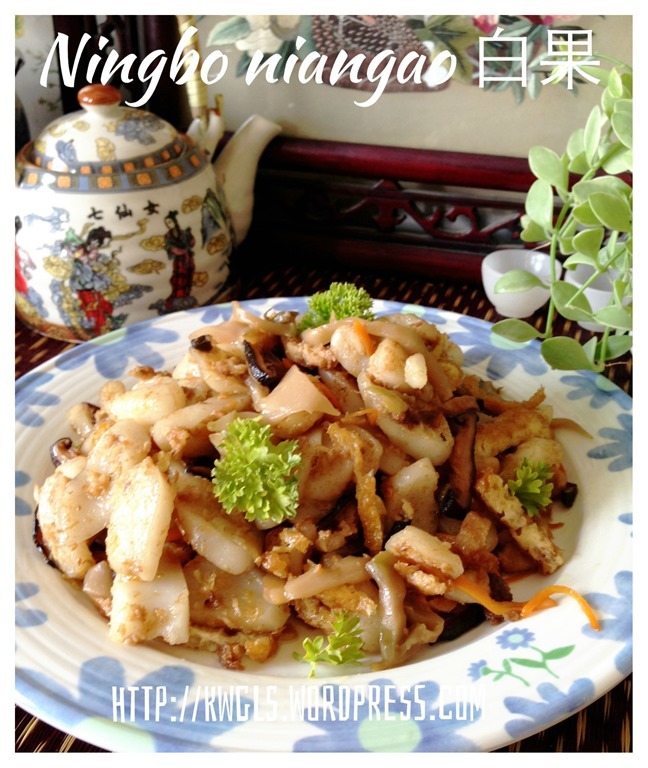 My hubby likes this dish and we always buy the dried 年糕 – i am certainly going to try this soon! Yes, homemade texture is so different from the texture of dried one. Do try.